***USE THE COUPON CODE ( superwater20 ) ON CHECKOUT FOR AN ADDITIONAL $20.00 OF YOUR ENTIRE ORDER, SPEND OVER $300, w/ NO TAX (**Except Florida). WE ARE AN AUTHORIZED GLOBAL WATER INC / BLULINE PRODUCTS DEALER. WE OFFER 100% COMPLETE WARRANTY COVERAGE ON THIS # G3RO Model. Questions? Please Call Us. PLEASE NOTE: THIS # G3RO ( 4 Stage ) Global Water Water Cooler Unit WITH REVERSE OMOSIS SYSTEM DOES NOT SHIP FREE: Discounted Freight Shipping and Insurance of $85 is added Post Sale on All Global Water Cooler Unit orders. 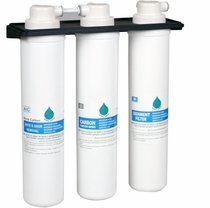 Note: This is listing is for the #G3RO Reverse Osmosis **4 Stage Filters Water Cooler Unit.